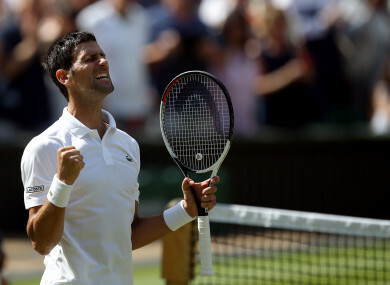 Novak Djokovic celebrates his win against Kei Nishikori on day nine of the Wimbledon Championship. It will be Djokovic’s first semi-final at a major since the 2016 French Open when he completed the career Grand Slam. “I think the first warning was unneccessary,” said Djokovic, who was sanctioned in the second set for spearing his racquet into the court. “It didn’t harm the grass. Kei did the same in the fourth set but wasn’t warned. “It feels great to be back in the last four of a Slam. I’ve been building in the last couple of weeks and my level of tennis is going up,” he said. “Do you think I ruined the court?” he bellowed at Ramos. Djokovic’s mood was not improved by Ramos choosing not to punish Nishikori for imitating his earlier offence of bashing a racquet into the ground. “Double standards, my friend,” screamed the former world number one. Email “Djokovic into Wimbledon semi-final, blasts 'unnecessary' warnings”. Feedback on “Djokovic into Wimbledon semi-final, blasts 'unnecessary' warnings”.